The “remarkable story” of a tall ship’s history in WWII and beyond—and the sailors who have inhabited it, both German and American (Booklist). Hamburg, 1936: A splendid three-masted sailing ship is christened Horst Wessel in the presence of Adolf Hitler and thousands of cheering Nazis. It would become a training vessel for naval officers during World War II—but after Germany’s defeat, the US Coast Guard found its young crew terrified and half starved. The Coast Guardsmen brought the Germans, so recently their mortal enemies, back to life; the Germans, in return, taught them the ways of the beautiful square-rigged ship, rechristened Eagle. 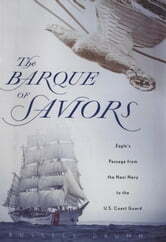 In time, Eagle would become the Coast Guard’s elite school ship—the barque of saviors. Uncannily linking Eagle’s malign past and its American present is a coast guardsman named Karl Dillmann, who believes the spirit of a young German sailor drowned in a U-boat explosion inhabits his soul. The voices of Dillmann and other crew members are heard throughout the book, as are the voices of young sailors on the Horst Wessel. Russell Drumm has obtained never-before-published logbooks from its war years, affording fascinating new insights into both the ship’s everyday life and its moments of high drama. This unique piece of maritime history captures the feeling of life at sea, and shows how the courage and sacrifice of the “greatest generation” are alive and well today in the dedicated members of the US Coast Guard.